The island of Kauai has a coastline of about 90 miles (145 km). Kauai beaches are known for their powdery white sand and uncrowded atmosphere – some are hardly visited at all, which means that you can easily find your tropical paradise beach on this island. 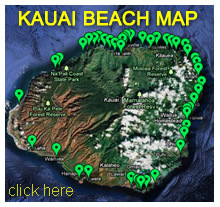 Many beaches on Kauai offer great swimming, snorkeling, scuba diving, surfing and kayaking conditions. Most Kauai beaches have white sand. A few others are rocky. Read more about beach sand composition. Kauai's north shore has many popular surfing beaches, such as Tunnels Beach and Lumahai Beach. Hanalei Bay with its crystal clear waters and views to the mountains is another popular north shore beach. And if you have seen the movie South Pacific, you may recognize the nearby mountain Bali Hai, also known as Makana Peak. Poipu Beach on Kauai's south shore is a popular beach among locals and visitors alike, while Polihale Beach on the west shore doesn't know crowds and is known for its amazing sunset views and "barking sands."